(Al Hartmann | The Salt Lake Tribune) Signs in the front yards of homeowners in the area of the old Cottonwood Mall site near 4800 S. Highland Drive in Holladay on Tuesday March 13, 2018. As Tuesday’s defeat of a high-density development in Holladay sank in, the election result was being viewed through many lenses. Some took it as a victory for residents over a Holladay City Council’s blind eye to public input. Others deemed it an encroachment on property rights and city authority. Observers saw the verdict as a signal that many Utahns have yet to come to terms with the state’s housing crunch. 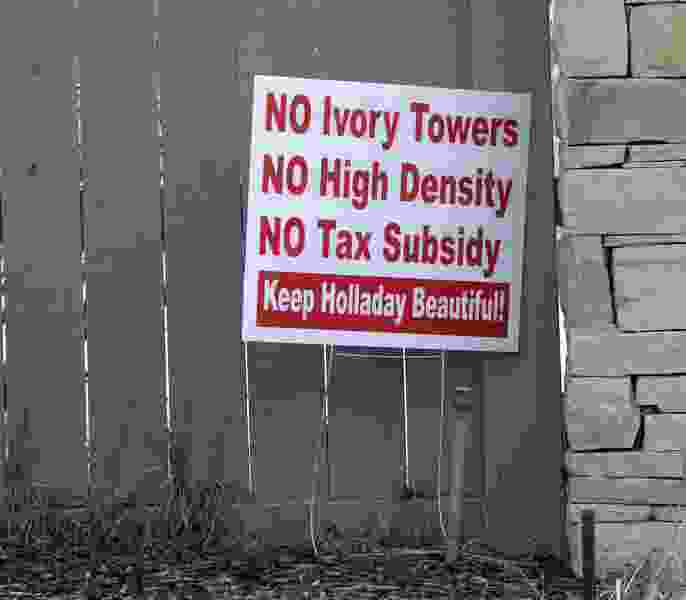 Holladay voters rejected a zoning master plan for a $500 million housing and commercial development at the old Cottonwood Mall site by a margin of 57 percent to 43 percent, culminating nearly two years of public hearings and community conflict over the controversial project. Some observers saw that result in the same light as another ballot measure Tuesday over a student housing project in Orem, which as of Wednesday hinged on a single vote. Business and municipal leaders warned of a “not in my backyard” trend that threatens to worsen an ongoing housing shortage. “If we’re looking at closing this housing gap of 55,000 units that we’re short of, we can’t continue to default to zoning by referendum,” said Abby Osborne, vice president of government affairs for the Salt Lake Chamber. She called the Orem and Holladay results, along with other signs of opposition to new residential development, “very concerning” — especially given that so much of the state’s population growth is homegrown. Nearly 14,275 Orem residents weighed in on what was called Proposition 5, a referendum on a Utah Valley University student housing project, with unofficial results from Utah County indicating that 7,138 residents backed the project, while 7,137 were opposed. According to unofficial numbers from Salt Lake County released Wednesday afternoon, 12,425 Holladay residents cast ballots on that city’s Proposition 14, even as the measure faced a still-unresolved challenge before the Utah Supreme Court. Of Holladay’s 31 election precincts, Proposition 14 won margins of support in only five, located in the far northeastern, southeastern and western pockets of the city. Utah developers Ivory Homes and Woodbury Corp. had sought to build a housing, office tower and retail development to the former mall site near 4800 South Highland Drive — including a 775-unit high-rise apartment tower and 210 single-family homes. Opponents insisted the project, dubbed Holladay Quarter, was too dense and too focused on housing instead of commercial development. A spokesman for Unite for Holladay, which pushed grass-roots petitions and gathered signatures for a vote on the project, said he hoped the wide margin Tuesday would prompt the city to put together a new, more appropriate plan for redeveloping the vacant mall site. “Now that we have perfect transparency in how the residents feel, this is everybody’s opportunity to come together and figure out the best way to do this as a community,” said Brett Stohlton, an organizer with the group. In a statement issued on election night, Unite for Holladay leaders said they “hope to see the Cottonwood Mall site developed in a way that creates enduring economic and community value." But from Mayor Rob Dahle’s perspective, Tuesday’s result appeared to torpedo the prospects of redevelopment on the site altogether, at least for the time being. Dahle said rejection of the Holladay Quarter master plan meant, in effect, that the city reverted to a set of zoning rules approved for the property a decade ago, when a previous developer’s plans for the 57 acres collapsed on the eve of the Great Recession. That project, the mayor said, isn’t going to be resurrected. And after staying quiet on Proposition 14 in recent weeks, officials with developer Ivory Homes huddled with business partners Woodbury Corp. and others early Wednesday to consider the project’s fate, in light of the site master plan’s defeat. The city and developers had challenged the legality of Unite for Holladay’s referendum petition in September in an appeal to the high court. They argued the City Council’s approval of the Holladay Quarter project wasn’t eligible for a challenge at the polls, because it was administrative and didn’t make new city policy. Unite for Holladay countered in legal briefs and oral arguments that the council indeed made new policy with wide-ranging effects elsewhere in the city, meaning its actions were “legislative” and fair game for a referendum. And while Unite for Holladay campaigned vigorously on Proposition 14, Holladay’s elected leaders and the project’s developers said they had expected the Supreme Court to invalidate the ballot measure well before Election Day — and so did not campaign. Osborne, with the Salt Lake Chamber, voiced renewed disappointment on Wednesday that the justices did not rule in time to avoid Tuesday’s election verdict. Now, as Holladay considers its next steps, observers of the zoning dispute warn the referendum’s message could hamper other development projects across Utah, just as officials are seeking to address an ongoing shortage of homes. Many called for reform to Utah’s grass-roots initiative laws to change the signature-gathering process and what kinds of zoning actions by cities faced review at the polls. A spokesman for the Utah League of Cities and Towns, representing municipal leaders and civil servants statewide, pointed Wednesday to nearly 27,000 building permits approved this year alone for new housing units in Utah.